Close your eyes and picture a pirate sitting on a beach. Let your brain relax and let the pirate be himself and watch what he does. Does he take a swig of rum? Start singing sea shanties to himself? Shout peculiar-yet-salty insults at whoever happens to walk by? Read from a book of poetry? Odds are that final option isn’t one that sprung into your mind – pirates, as a rule, aren’t really considered to be history’s great poets, nor were they exactly patrons of the written arts. In fact, letters – save those of “marque” or “x” – were generally pretty useless to them. But this is probably because it wasn’t until 2008 that someone got around to collecting an anthology of pirate poetry. Had such a thing existed in the 1700’s, I’m sure many pirates would have taken their literary studies far more seriously. Raising Black Flags: Original Poetry By and About Pirates is a collection available through Lulu Press. Edited by Stephen Sanders (a.k.a. 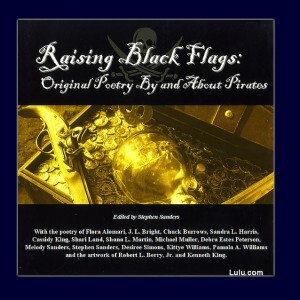 Blackbead), it features 39 original pirate poems contributed by 16 pirate poets. Most of these names will seem unfamiliar until you read their biographies, at which point anyone familiar with the online and real world pirate communities – especially the Pyracy Pub – will recognize may familiar nom de plumes. I freely confess that I don’t often read from books of poetry, as I’ve the attention span of a jelly fish. But I’d also suggest that if you are to read poetry, pirate poetry would seem the way to go. And Raising Black Flags clearly has much to offer. Poems range from the long to the short, the silly to the somber. Some speak of real world situations we modern pirates face, such as “A Pirate’s Life For Me: Being a Pirate at Renaissance Faire” by Melody Sanders. Others tell of historical pirate realities, such as the wonderful “The Captain’s Coat”, which really ought to be put to music someday. And many others blend the real world of pirates with the worlds of ghosts and mythology – poems of mermaids, sirens, and specters. Raising Black Flags would seem a fine gift for the pirate who has everything, or make for an excellent waiting room or coffee table book. Reading a poem here and there would seem an excellent way to add a little extra dose of piracy to our modern lives – and that’s always a good thing. This entry was posted in Books and tagged poetry by Bilgemunky. Bookmark the permalink. I have one on my coffee table. 🙂 Thanks, Bilge! Ahoy, Bilge! Thanks for running the review and your very kind words! I wanted to let your readers know that the book is also available through Amazon, Barnes and Noble, Books-A-Million, BookFinder4U, Alibris, and even WalMart! I believe that before Christmas Amazon and B&N were running specials on all of their books and you might still be able to get “Raising Black Flags” for $10.75 instead of the publisher’s price. We will also have copies at all of the shows that “Blackbead’s Treasure Chest” will be doing this year so stop by when you see us! Once again, thanks, mate! Hey! Go check out the video news story about the book on http://www.DFWReporting.com! If you have a couple of minutes, please leave a rating and a comment. Fair winds to ye all! “For Gabrielle the belle of the Pirate Ball, for the good sailors below from Cardiff, Portsmouth, and Wicklow, for the galley cook stuck on a strand eating his weeviled stew, for the firebrand betrayed who sits by the fire remembering her days of “rollick and ire”, for the old sea captain who visited one night to comfort his son and faded from sight, for the smell of the ocean, the pitch of the deck, we sign up aboard a slovenly wreck and don dead men’s clothes and wear tattered rags, jest for the chance to be Raising Black Flags!